When should you take an eye test? In any of these cases, you do not necessarily need to consult an eye doctor. 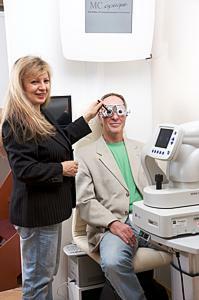 An optometrist will be able to provide competent help founded on years of thorough professional training. We will determine the correct and ideally suited lenses based on the feedback you provide (subjective measuring method) rather than on computer or refractometer measurements alone (objective measuring method), which only serve as a means of diagnostic orientation. In the event that one or more of the above symptoms should apply to you, why not take our express eye test for a start? Please remember, though, that it is no substitute for a comprehensive, professionally sound examination by an expert – by the specialists at MC optique, for example. At MC optique we use the measuring apparatus best suited to simulate the view through spectacles to determine the lenses that are right for you. And we provide a guarantee of good individual tolerability for the lenses we prescribe. Should you nonetheless find you have problems with your lenses, we will be happy to replace them with optimised ones free of charge. 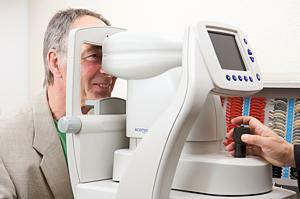 Alterations in the quality of eyesight can be an indication of changes in the anatomy or the health of the eye. So please be sure to come in regularly for free-of-charge eye testing. Should we suspect an abnormality of the eye, we will recommend that you consult a doctor. When should you consult an eye doctor? An eye doctor, or ophthalmologist, needs to be consulted for examination, diagnosis and treatment of any possible eye diseases. Since some eye diseases tend to develop very slowly, the patients themselves are not likely to notice them. It is advisable, therefore, to have your eyes examined regularly by a doctor when you reach a certain age. Once you turn 40, for example, it is wise to have regular checks carried out on your eye pressure and field of vision to ensure timely identification and treatment of diseases such as glaucoma. We recommend annual check-ups. A healthy eye with no defects of vision will project a clear image of near and far objects onto the retina. The eye’s lens will curve as needed in accordance with the distance of the object of focus. This process of adaptation generally allows the eyes to focus clearly on objects which are anywhere between 10 cm and infinitely far away from us. If the image it captures, however, is not projected onto theMyop retina, but rather behind or before it, our acuity of vision is reduced, and this denotes defective vision. In the case of short-sightedness, the image captured is produced before the retina; in the case of hypermetropia, or far-sightedness, the image is produced behind the retina.